"Dad said you should never go off trail." IFC Midnight has unveiled an official trailer for a horror thriller titled Desolation, the feature directorial debut of filmmaker Sam Patton. This first premiered at the Los Angeles Film Festival, but hasn't played at too many other festivals. 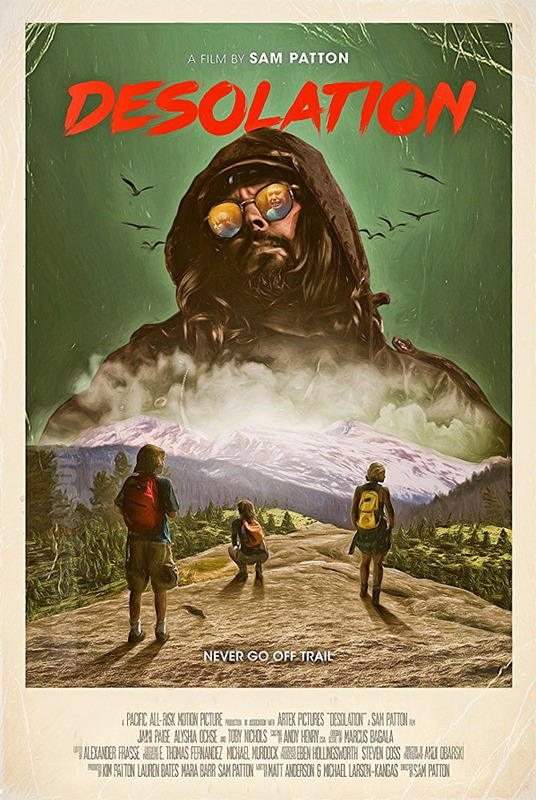 In Desolation, a young mother, her best friend and son venture into the wilderness for a camping trip only to find themselves the hunted prey in a deranged killer’s terrifying game. The cast includes Jaimi Paige, Alyshia Ochse, Claude Duhamel, and Toby Nichols. This looks like an interesting horror thriller, but I'm pretty sure I've already figured out the twist. Though I guess I don't really know. The sunglasses dude doesn't seem that creepy, but that's just me. A young mother (Jaimi Paige) takes her son and her best friend on a trip into remote wilderness to scatter his father's ashes; they must confront their fears when a lone hiker begins following them. Desolation is directed by young filmmaker Sam Patton, making his feature directorial debut after a few short films and production assistant work previously. The screenplay is co-written by Michael Larson-Kangas and Matt Anderson. This first premiered at the Los Angeles Film Festival earlier this year, and also played at the American Film Festival in Poland this fall. IFC Midnight will release Patton's Desolation in select theaters + on VOD starting December 15th later this year. Follow @IFCMidnight for more news. Anyone interested?